My first childhood gun was a toy licorice pistol, but I soon advanced to a BB gun, pellet gun, .22 pistol and rifle, shotgun, and (see R.O.T.C. Cadet) carbine. I have hunted and target shot, even firing rounds with a muzzle-loading Kentucky Long Rifle. (See my "Historical Sketches: Muzzleloaders," The Licking Valley Courier, Dec. 4, 2008.) 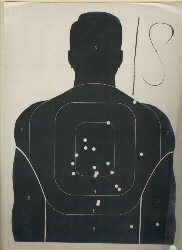 Here is my qualifying target—partly rapid fire—from the firearms course at the U.S. School of Law Enforcement. I came in third in my class, using a borrowed Smith & Wesson .38-caliber revolver (see Armed Guard).